Follow me on Facebook to see more Fine Art and Boutique Gift Items by Carolyn Collins Photography. Just click on the photo and LIKE my FB page! David Call of Alchemy Arts discusses recent works by Carolyn Collins Photography with an interested guest during a special event at Edo Popken of Switzerland. Follow Carolyn on Facebook – just click on the photo and LIKE her FB artist page! The Seven Project’s collaborative art exhibit for a cause! I have the honor to be a part of this incredible collaborative art project, which has evolved into the most amazing event to support a very worthy cause! 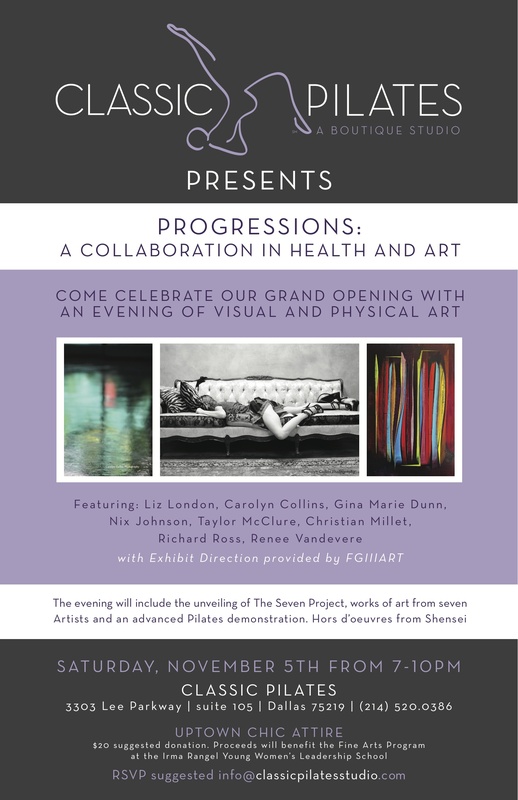 Classic Pilates Studio is hosting the silent auction of seven unique collaborative art pieces by The Seven Project, as well as new and exciting individual works by the project’s collaborative artists and our guest artists for the evening, Frankie Garcia III and Renee Vandevere. This Saturday’s exciting event will take place in the Turtle Creek area of Dallas, Texas and will feature pilates demonstrations, new art, live music by Matt Barron, and an engaging introduction to this event’s beneficiary, The Fine Arts Program at the Irma Rangel Young Women’s Leadership School. Light bites will be generously provided by Shensei. Visit Art & Seek’s calendar for details of the event. To learn more about the collaborative art project benefitting the Dallas community, visit The Seven Project’s page on Facebook. The project’s artists work and reside throughout North Texas and include Christian Millet, Nix Johnson, Gina Marie Dunn, Taylor Douglas McClure, Liz London, Richard Ross, and yours truly. This project has been a tremdously challenging and inspiring journey for me over the past two months. The project itself has been such a wonderful experience and opportunity for us all. So much so, that we have already begun preparation to lead a new group of collaborative artists in our next project during the spring in 2012!!! This and works by several generous artists will be shown Saturday, May 7th at the 21st annual Asian Festival (read further for event and beneficiary details). Nov 2, 2011 Wasn't yesterday March 31st? 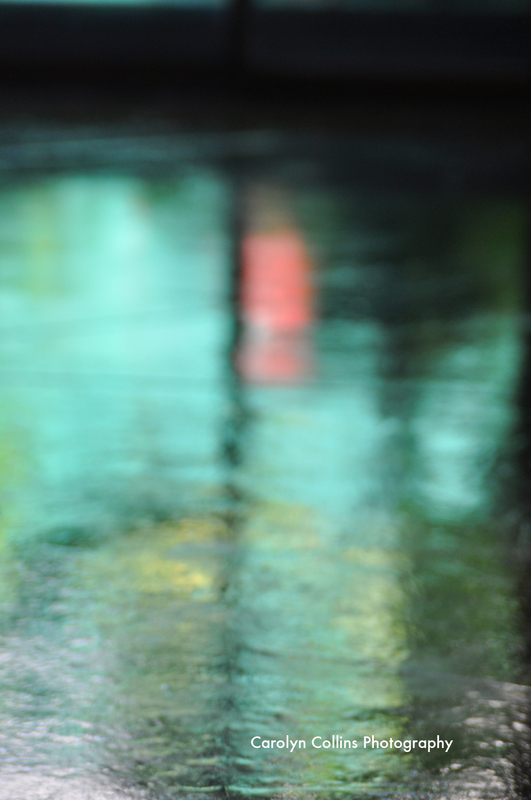 Ahhh... life, photography, art, music, new website, new collaborative projects and new conceptual works have consumed me...in the very best of ways! Mar 30, 2011 Photo-Ink Challenge (TM) #20 was just posted on my Facebook artist page; framing eight new works for this weekend's opening reception; began new series 'I Dream of Horses'. Feb 12, 2011 special collaborative shoot of the lounge/rock fusion band Aristoscats with Denton based musician/videographer Michael Tillman. His music always acts as my transport into a daydream of delightful experiences. His efforts to help others is humbling. Feb 10, 2011 began four new pieces for my Blind Stitch series of one-of-a-kind handmade original mosaic/quilt prints... this time, all components of the process itself will be preserved for exhibit alongside the finished artwork, thanks to the awesome suggestion by Luminarte Gallery owner Jamie Labar. Jamie is also an amazingly passionate painter and phenomenal interior designer. She has quickly become an important mentor to me as an artist. Feb, 2011 shooting plans begin for an ongoing collaborative series of art pieces with Denton based painter, writer and graphic artist Christian Millet. Intensely expressive and challenging in all he does, he brings layers of depth to the lighthearted and joyful play to dark matters. He 'gets' my photography and has become like a brother and mentor in a short time. Christian is also the Art Director (U.S.) for Luminarte Gallery. 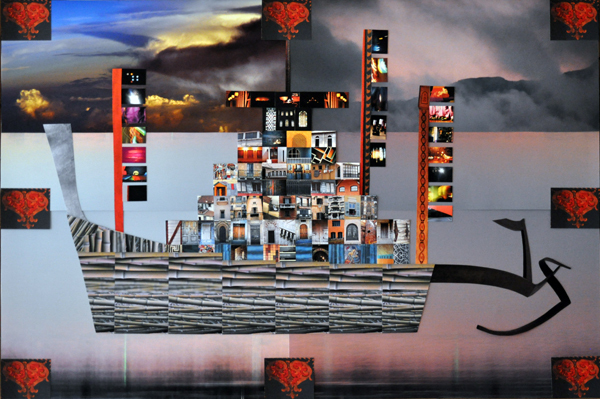 Jan 30, 2011 began work on a multi-media collaborative art project with Dallas based painter, writer and videographer Jim Lively. A creative genius in all that he takes on, Jim is also the Senior Gallerist of Luminarte Gallery). The first installation/exhibit is expected to be in April, 2011. Jan 29, 2011 began an ongoing documentary shoot, which will be incorporated into a multi-media, multi-layered production, installation and live performance 'happening' later this year. This project, initiated by the Luminarte Gallery team, will involve an extensive, mind-blowing team of visual artists, performing artists and production crew. 2011 will be a focus of artistic, altruistic and business collaboration with visual artists, musicians and more!!! December, 2010 has opened amazing doors of opportunity and challenge for me as a photographer and an artist, thanks to some outstanding board members of Luminarte Gallery in the Dallas Design District. Jul. 12th, 2010 this week will have: blues/folk cd cover shoot, hip-hop cd cover shoot, and blues/rock/funk promo shoots/videos. May, 2010 first commission as a personal inventory photographer... amazing what needed to be insured. Spring, 2010 was when I finally became a full time photographer!!! Dec. 1, 2009 was the starting point of a one-year collaborative project with several singers/songwriters. Oct. 17, 2009 began "Secret Shoot", a twelve-month photography project (documentary/portrait/art). kseverny on let the shooting begin!